Opened shortly before the start of the Football World Cup in Germany, the impressive Mercedes-Benz Museum is housed in a slick, contemporary building, an icon of modern architecture. 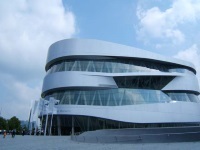 With an exhibition space of almost 182,986 square feet (17,000m/sq), filling seven levels, the museum takes visitors on a chronological journey through the history of the Mercedes automobile, combining world events occurring at the same time as Benz breakthroughs and displaying more than 160 different vehicles from racing cars and concept cars to the pope mobile and airplane engines. Automobile aficionados will be in heaven but even for non-petrol heads there is a lot to see in this world-class museum which covers a lot of interesting history through the lens of the automobile. Visitors take the elevator to the top of the building and then wind their way down chronologically on a spiral until they reach the ground and the present day. There is a museum shop, a restaurant and a cafe/bar to be enjoyed on the premises. An audio guide is available. Opening times: 9am - 6pm Tuesday to Sunday. Closed on Monday. Admission: €10 for adults. Free for children aged 14 and under.